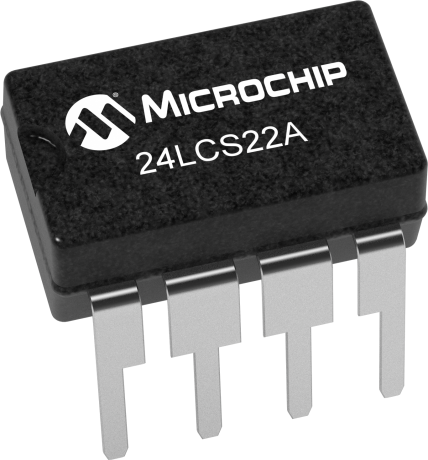 The Microchip Technology Inc. 24LCS22A is a 256 x 8-bit dual-mode Electrically Erasable PROM (EEPROM). This device is designed for use in applications requiring storage and serial transmission of configuration and control information. Two modes of operation have been implemented: Transmit-Only mode (1 Kbit) and Bidirectional mode (2 Kbit). Upon power-up, the device will be in the Transmit-Only mode, sending a serial bit stream of the memory array from 00h to 7Fh, clocked by the VCLK pin. A valid high-to-low transition on the SCL pin will cause the device to enter the Transition mode, and look for a valid control byte on the I2C™Compatible bus. If it detects a valid control byte from the master, it will switch into Bidirectional mode, with byte selectable read/write capability of the entire 2K memory array using SCL. If no control byte is received, the device will revert to the Transmit-Only mode after it receives 128 consecutive VCLK pulses while the SCL pin is idle. The 24LCS22A is available in standard 8-pin PDIP and SOIC packages. The 24LCS22A features a flexible write-protect pin which is enabled by writing to address 7Fh (usually the checksum in VESA® applications.